I Can’t Believe It’s Not LEGO: Playmobil, in Competition or Comparison? I haven’t only played with LEGO in my life. 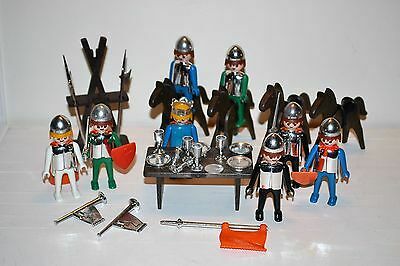 Back in Christmas 1974 we received our first Playmobil Knights sets. We were frustrated by the legs being locked together, and I managed to give one of our figures independently moving legs. It took quite a bit of force! I hadn’t ever really considered Playmobil to be a competitor with LEGO as I grew up. One was for building with, one was for role play/ setting up dioramas. That was easy in 1975, before mini figures with silly faces and moving limbs existed. And that seems to be how it has been culturally in Australia. LEGO is available in most toy shops and department stores, and large retailers (Thinking target, Kmart, Big W) While Playmobil has almost exclusively been in the domain of the smaller, independent toy shop. We have continued to pick up the occasional playmobil set, especially for Grandma and Grandpa’s holiday house, where our children would often play with them. With the exception of a nurse in 1978, be have basically stuck with variations of the medieval theme. I knew Playmobil had continued to be a thing, but I hadn’t really worried about it. Then coming home through Belgium in 2016, I saw an orange Porsche 911 on the shelves at the Duty Free Shop in the airport.